We are excited to announce the opening of our newest location in Oxford located on Lapeer Rd. We are excited to announce the opening of our newest location in Flint located at the corner of E. Court St. and Center Rd. 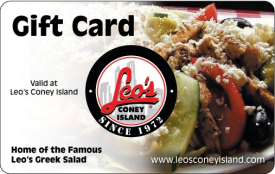 We are proud to announce the launch of Leo's Coney Island's new website! View on your mobile devices, find a location near you and see what's new! We are proud to announce the opening of Leo's Coney Island serving the great community in Woodhaven. We are excited to announce the opening of our location in the McNamara Terminal. We look forward to serving you at our airport location. The Macomb Township location is great addition to the Leo's Coney Island family, and we look forward to seeing you in our new location. The Commerce Township location at 14 Mile Rd. and M-5 is a great addition to the Leo's family. Don't forget to take advantage of our tasty breakfast specials. Specials are offered Monday-Friday from 6am until 11am and Saturday-Sunday from 6am until 9am. Please see individual locations for hours of operation to take advantage of an amazing deal.